Designed specifically for well water contamination to protect from bacteria, viruses and other contaminants commonly found in private well water. Includes a carbon media upgrade, larger 20 pre-filter, sub-micron post-filter and our Sterilight Ultraviolet Filter. Get clean, great-tasting water from every tap in your home by removing 97% of chlorine in regular tap water. Also reduces other harmful contaminants including. Heavy metals like lead and mercury. Organic chemicals like herbicides, pesticides and VOCs. Industrial solvents and more. Top chefs know that using filtered water produces stronger flavors, quicker cooking times and all-around optimal results in the kitchen. With cleaner, healthier air. Chlorine and volatile organic chemicals (VOCs) can evaporate in shower steam, contaminating the air you breathe. TESTED AND PROVEN TO REMOVE. Instantly improve your indoor air quality by filtering the water throughout your home. Reduce your body’s exposure to harsh chlorine and synthetic chemicals that can cause damage and excessive drying. Bathe yourself in Aquasana filtered water for noticeably healthier, more moisturized skin and hair. Intelligently engineered to maximize potent filtration media for ultimate performance. The Aquasana Rhino’s unique upflow, dual tank design increases water contact time with contaminant grabbing media and prevents clogging or media channeling. System tested and proven to remove 97% of chlorine for 500,000 gallons or 5 years. SCM salt-free softening technology naturally and safely reduces scale buildup on internal pipes and plumbing without the use of harsh salt or chemicals. Learn more about SCM technology ». Compare the benefits of SimplySoft vs. Scale and corrosion without SCM protection can build up in your plumbing and appliances. Protect your home and appliances with an Aquasana SimplySoft whole home solution. Worried about boil warnings because bacteria and chlorine resistant cysts are making your water non-potable? Get total home protection to safeguard against bacteria and viruses that may be present in your water. POWERFUL UV FILTRATION KILLS 99.99% OF VIRUSES, BACTERIA LIKE E. COLI, AND CHLORINE RESISTANT CYSTS LIKE CRYPTOSPORIDIUM AND GIARDIA. PRO GRADE INSTALL KIT. Upgraded components to make your system professional grade. BRASS FITTINGS Easier to install and maintain over time. BEND SUPPORTS & SHUT-OFF VALVES for a bypass loop for easier filter changes. PEX tubing not included. 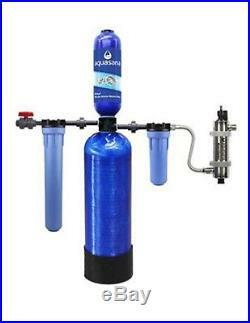 Base install kit for EQ-Well-UV includes: plastic fittings, a 20 pre-filter, a sub-micron post-filter and a UV filter. Does not include brass fittings or bend supports and shut-off valves for by-pass loop. The item “New in Boxes Aquasana Whole House Water Filtration System” is in sale since Wednesday, April 11, 2018. This item is in the category “Home & Garden\Home Improvement\Plumbing & Fixtures\Water Filters”. The seller is “chucksdrumcloset” and is located in Byhalia, Mississippi. This item can’t be shipped, the buyer must pick up the item.